Olde Good Things furniture store hours, location, products and services. Furniture Store in downtown Los Angeles at 1800 South Grand Avenue. Stores located in Madison Ave. NYC, Bowery NYC, Union Square NYC, Grand Ave. LA and Scranton PA area. You can order and buy online or in-store / showroom. Olde Good Things is a Pennsylvania based furniture company delivers nationwide. Olde Good Things Furniture Store in downtown Los Angeles, California. 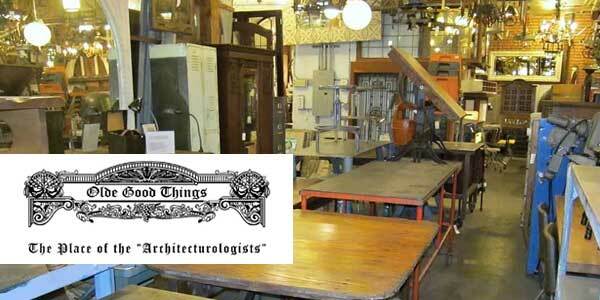 The largest architectural salvage company in the USA. 1800 South Grand Avenue, Los Angeles, CA 90015. 11240 West Olympic Boulevard, Los Angeles, CA 90064. 450 Columbus Avenue, New York, NY 10024. 5 East 16th Street, New York, NY 10003. 124 West 24th Street, New York, NY 10011. 400 Gilligan Street, Scranton, PA 18508.